Eight months after the start of Chipotle’s E. coli outbreak, one lingering question continues to plague investors and analysts: will the company ever fully recover? There have been some promising signs that customers are returning to Chipotle. Restaurants are starting to fill up again, and customer surveys show growing positive sentiment for the company. But it’s unclear how much of Chipotle’s growing foot traffic has been driven by its multi-million-dollar investment in free burrito promotions, and how much can be attributed to customers actually recovering their trust in the brand. Prior to the outbreak, same-store sales were growing by more than 20%, and the stock was trading at more than $750. Since then, sales have plunged, falling by nearly 30% in the most recent quarter. The stock is now trading around $400. “One common theme investors and industry experts alike share, at this time, is a lack of certainty on when a recovery will take place, how the company will get there or what the magnitude of Chipotle’s resurgence and what it will look like,” Deutsche Bank analysts wrote in a recent note. The analysts predict that sales will start to turn modestly positive by the end of the year, when the company laps the quarter that was initially affected by the outbreak. But they questioned whether Chipotle’s sales and profit margins will ever rebound to levels seen before the outbreak. “On the positive side, the company still has a base of loyal fans,” the analysts wrote. But traffic trends were showing signs of slowing before the outbreak, they note, and the company will face a number of other challenges going forward. 1. The growth of copy-cat chains. While Chipotle was trying to contain its E. coli outbreak, the company’s loyal customers were out discovering new chains. In fact, Moe’s Southwest Grill recently unseated Chipotle as Americans’ favourite Mexican food chain, according to a Harris Poll survey of more than 97,000 US consumers. 2. Increased promotional activity across the restaurant industry will force Chipotle to maintain a higher-than-average rate of discounting going forward. Chipotle has given away tens of millions of dollars in free burritos since February to try and persuade customers to come back to the chain. Customers are now trained to expect these offers, and it will be hard for the Chipotle to go back to charging full price. This will weigh heavily on the chain’s profit margins. “It would stand to reason that the company’s full priced sales will fluctuate for quite some time,” the analysts write. 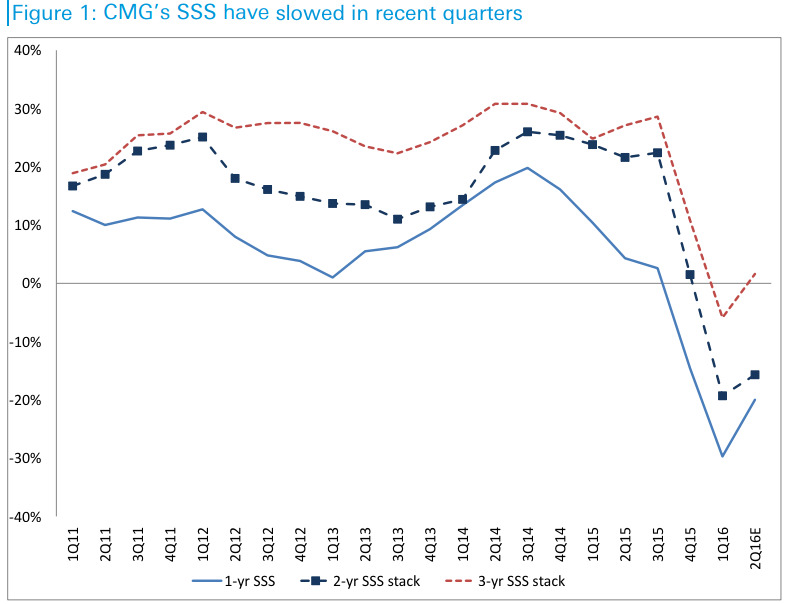 Deutsche BankChipotle’s same-store sales trends. 3. 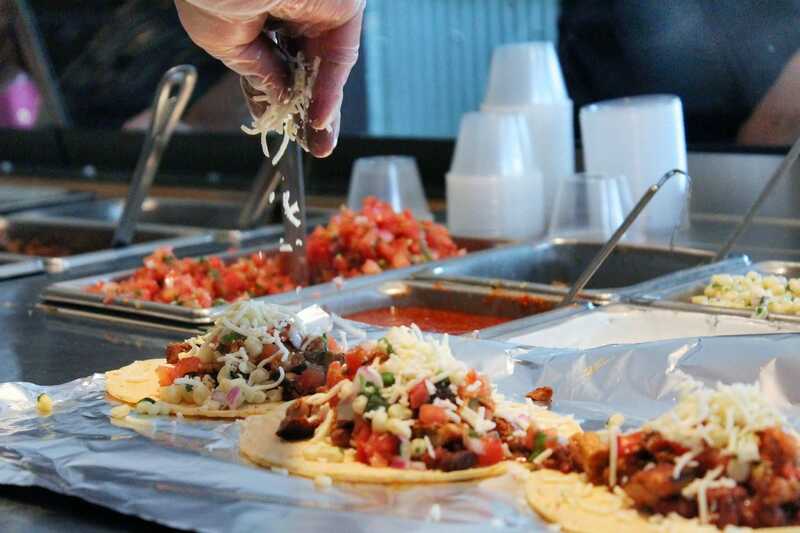 Chipotle’s expansion plans risk cannibalising sales from its existing restaurants. The new restaurants may also have lower volumes than more established restaurants as they back-fill existing markets or enter new, less attractive markets, according to the analysts. 4. Labour and technology will require higher investments. The restaurant labour market is under pressure. There are fewer workers for hire, so competitive pay and benefits are becoming more critical for companies like Chipotle. Labour costs are also increasing as local governments across the country pass legislation for a higher minimum wage. In addition to ballooning labour costs, Chipotle will need to make major investments in technology to stay competitive, according to the Deutsche Bank analysts.